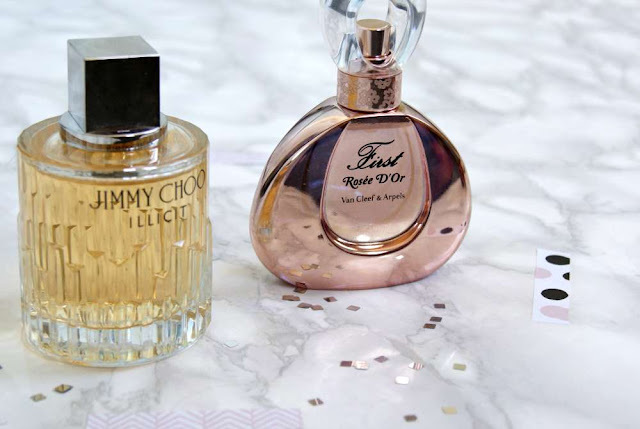 The two fragrances I am reviewing are Jimmy Choo's latest eau de parfum: Illicit and First 'Rosée D'Or brought to us from Van Cleef and Arpels; I am one lucky beauty blogger to have the chance to review these beauties! 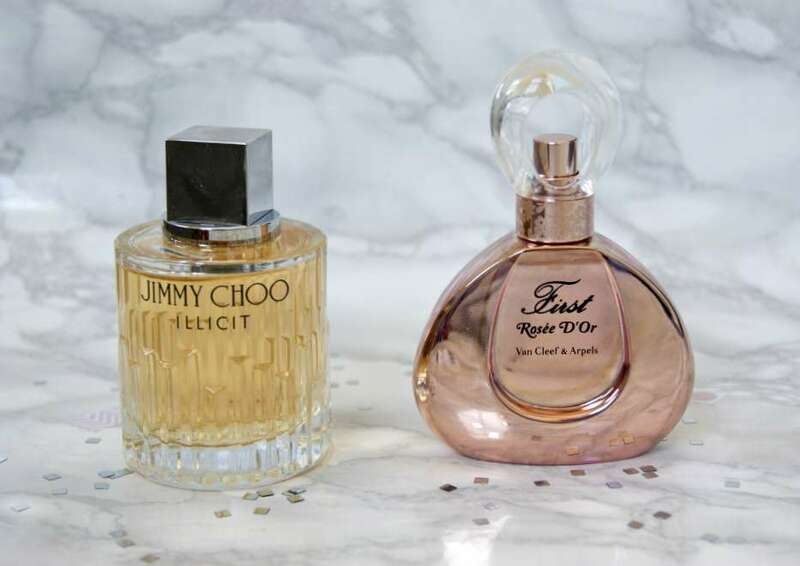 When you find a fragrance that you love there is no going back it’s cemented on your makeup mantel piece until the last drop and I can safely say mine has two new additions. Taking a closer look at Jimmy Choo,Illicit I realised that I have never actually owned a Jimmy Choo fragrance before even though I do have a tiny obsession with Jimmy Choo shoes and handbags. 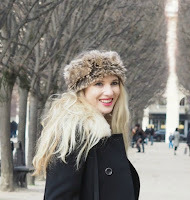 This fragrance has literally just hit the shops, so I am lucky to be one of the first to review this luxurious scent. This new fragrance has been created to embody the confident, feminine and alluring ‘Jimmy Choo’ woman. The top notes are strong with orange and ginger with deeper notes of jasmine, honey-amber, rose and like most fragrances sandalwood. 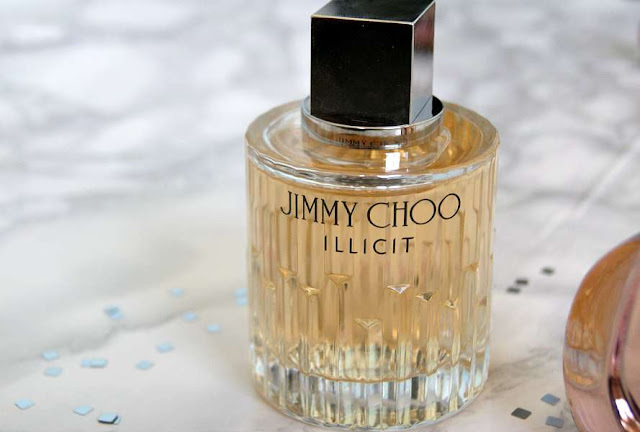 Illicit has quickly become one of my favourite fragrances, usually I use my fragrances either just for day or night but I love this for absolutely anything. 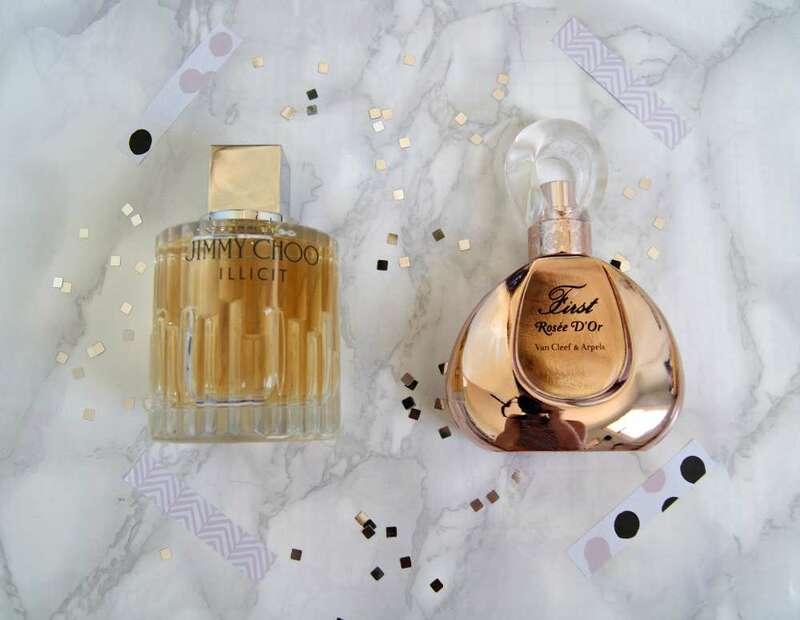 Like all my fragrance posts I like to not only review the scent but the bottle as well and this embodies what the fragrance and brand is with gold liquid encased in a crystal style cylinder, looking purely decadent. Jimmy Choo Illicit Eau De Parfum has now launched 40ml: £42, 60ml: £54, 100ml: £78. The next fragrance is another decedent brand, Van Cleef & Arpels better known for their incredible jewelry. First by Van Cleef & Arpels was first created in 1976 and it has been brought back to life with a limited edition, Rosée D'Or. First oozes elegance from the brand. 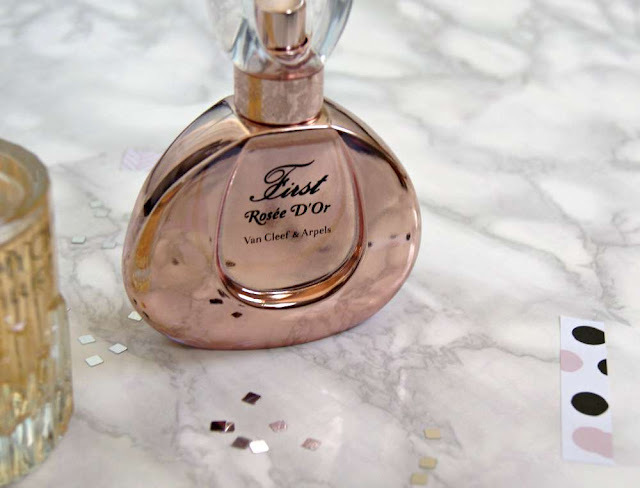 First, Rosée D'Or has with hints of the original perfume using natural ingredients with light top notes with bergamot and aldehydes. A floral arrangement as middle notes of white rose, ylang-ylang and jasmine which is the most dominant tone. Rose has been added for this limited edition which intensifies the fragrance and adds freshness. Then left over you can smell vanilla, warm blond woods, musk. The bottle has a more modern feel to Illicit, although it uses a similar colour pallet with gold and pink for an elegant look with a metallic veil hinting at what is inside.